The United States of America has an abiding problem: it has no name. 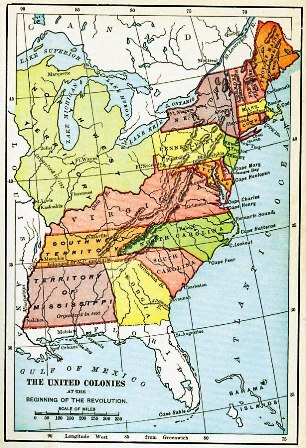 That is, each state (“state” meaning an individual political entity with supreme authority) would be its own country like Great Britain or France, and people would refer to themselves as “Virginians” or “Pennsylvanians” or whatever. The United States of America would not be an actual country but rather a coordinated grouping of separate countries located within the huge land mass of America. Our Founding Fathers had a lot of ideas that didn’t work out, and at least this one was nowhere near as tragic as slavery. The United States of America almost immediately became one single country despite their expectations. Nature abhors a vacuum, so by the time George Washington left the office of President, he was speaking of “[t]he name of American” as our appellation. Question: Where do Americans live? Answer: Anywhere in North, Central and South America. Residents of Center [sic] and South American also refer to themselves as Americans. What do you call someone who speaks only one language? Someone from the United States. Besides, Mexico is actually the United States of Mexico, and over history there has been a United States of Brazil (1889-1937), United States of Columbia (1863-1886), and United States of Venezuela (1864-1953), to name just a few. So even using “United States” or “US” to designate ourselves won’t protect us from the most quibbling snark. We have no real name, and we can only be careful, as the New York Times Manual of Style and Usage says, to be sure that the context makes clear what we mean by “American,” “America,” and “the Americas,” since Argentinians are Americans, too, after all. And unless someone comes up with a workable alternative – snarkers, be constructive for once – citizens of the United States of America are “Americans” because we have a country with a descriptor, not a name, and that’s the best we can do. I feel your pain. There's no name for someone from the United Kingdom, either. Yes, another country that did not think things fully through. And I'm sure you've heard the comment that before our Civil War, people would say "the United States are such-and-such," while after the Civil War, they'd say "The United States is such and such." Additionally to the US and UK, the Austrian half of old Austria-Hungary didn't really have a name; "Austria" comes from the concept of the "eastern realm" of the House of Habsburg (weirdly, Austria derives from the German Ost meaning "east" and not the Latin auster which means "south"). I wonder if it's meaningful that all these political entities predate the modern idea of nationalism? That's an interesting idea. If you have political entities rather than nations, do you need a specific name? Well, there were specific names: England, Scotland, Wales; Lower Austria, Tyrol, Bohemia - but the overarching government was personal and dynastic and they didn't care whether it felt like one thing to the people, because who cared about their opinion? The US was founded in a time of transition from this way of thinking to the nation-state way of thinking, and in a lot of ways, the founders didn't think the whole thing through. True, and for a lot of countries, like France and Germany, borders moved around from time to time, and people just dealt with it. Often a country contained several nationalities. These days, the feeling is more like every nationality deserves its own country, no matter how small.